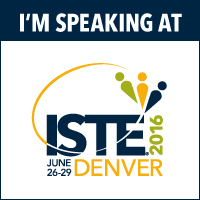 2016 ISTE Denver - iKinder, Do You? Our 4 year pilot study of language immersion using iPads demonstrated that, not only can English Learners and students of poverty close achievement gaps by 3rd grade, in some cases they may out-perform English-only students! We'll share apps. design thinking, research, teacher's practices, and student impact stories. See the Early Literacy program in action at the preschool level. Calistoga Summer Bridges Video (the program that started it all!